ST. GEORGE — Police are reminding citizens to be alert and know how to identify counterfeit $100 bills that are being passed in the area. 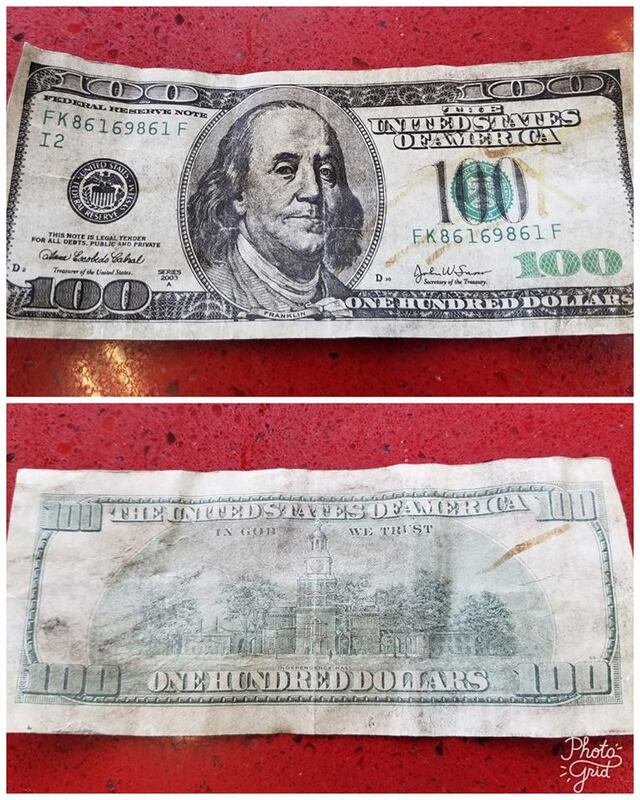 “We were asked by a local business to share this picture in hopes of alerting others that people are trying to pass these counterfeit bills here in St. George,” the St. George Police Department said on its Facebook page Thursday. Businesses and the public can better protect themselves from receiving counterfeit bills by checking for security threads, microprinting, watermarks, color-shifting ink, red and blue threading and if the first letter in the serial number coordinates with the correct year of print, authorities said. In bills issued from 1996 to 2013 – like the ones reportedly being passed in St. George – individuals can take the following steps to help spot a fake $100 bill. Notice the color-shifting ink. Tilt the note to see the numeral “100” in the lower-right corner of the front of the bill shift from green to black. Look for the portrait watermark. Hold the bill to light and look for a faint image of Benjamin Franklin in the blank space to the right of the portrait. The image is visible from both sides of the bill. Take note of the security thread. Hold the bill to light to see an embedded thread running vertically to the left of the portrait. The thread is imprinted with the letters “USA” and the numeral “100” in an alternating pattern and is visible from both sides of the bill. The thread glows pink when illuminated by ultraviolet light. Feel for raised printing. Move your finger along the bill’s surface to feel the raised printing, which gives genuine Federal Reserve notes their distinctive texture. Spot the microprinting. Look carefully – magnification may be necessary – to see the small printed text “USA 100” within the numeral in the lower left corner and “THE UNITED STATES OF AMERICA” in the line in the left lapel of Franklin’s coat. Businesses can also use a security pen to check the bills received from customers. The pen is a device used to apply an iodine-based ink to banknotes in an attempt to determine their authenticity. However, authorities said businesses shouldn’t rely solely on the pen. “Counterfeit detection pens are not always accurate and may give you false results, which is why we recommend relying on security features such as the watermark and security thread,” according to the United States government. Police are asking anyone who comes across one of the fake bills to get as much information as possible on the person passing the bill and call the St. George Police Department at 435-627-4300.